I really want a wind chime, but not a metal one. I've always wanted a bamboo one. I feel like they are far more soothing and way less tingy. I like this one because it has a cute little birdhouse in it, too! Available at Overstock. These six hand-tuned bamboo tubes, adorned with a grass bird nest, play a range of soothing musical tones when the breeze blows gently through them. 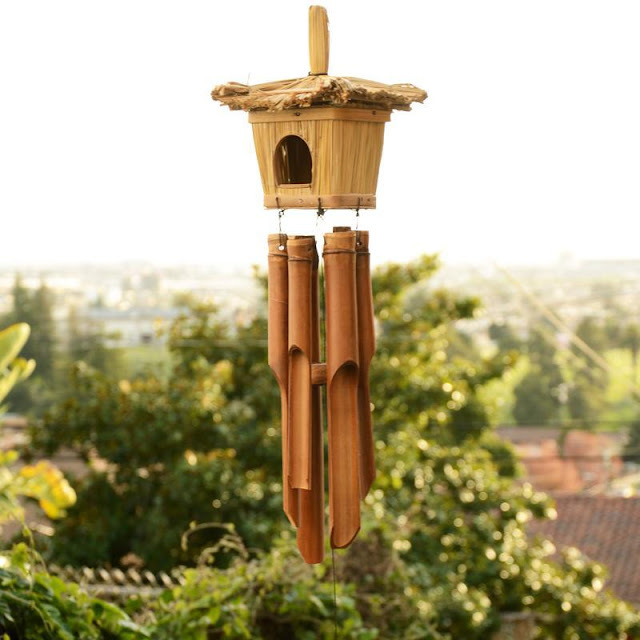 This environmentally friendly wind chime is handmade by artisans in Indonesia using rice shoots and bamboo, which are two types of organic material which are grown sustainably all over South East Asia. This handcrafted bamboo chime has been made by Kedek Setiawan who lives in a village in Bali where most people work with bamboo. The technique has been kept intact for many generations, passed from elders to children. Kadek learned his bamboo furniture skills from his father and started making chimes for his children. He quickly discovered his creative side, which could be satisfied through his craftwork.